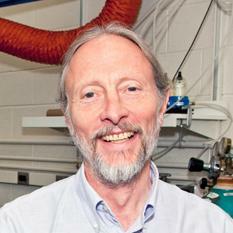 Long's research focuses on the development and application of new laser diagnostic techniques to the study of combustion. By using a laser to probe a reacting flow, it is possible to make non-intrusive measurements that are instantaneous compared to the flow time scales. A number of different laser light-scattering techniques (Lorenz/Mie, Rayleigh, fluorescence, and Raman) are used for measuring temperature, species concentrations, and velocities in laminar flames as well as in turbulent reacting and nonreacting flows. Whenever possible, we seek to make measurements in two or even three dimensions. The research is multidisciplinary and involves aspects of light scattering, fluid flow, combustion chemistry and detector, and computer technology (example 1, example 2). As part of the research, he has developed software for acquiring and processing digital images. That image processing software is now available free of charge to interested users. Along with his students, Long collaborates closely with Prof. Mitchell Smooke at Yale on a project involving detailed computations and measurements in laminar flames. They seek to bring together the state-of-the-art in both computations and experiments on a well-characterized burner and to do comparisons. This collaboration has had an important impact on both the diagnostics and the computations. The initial work on these laminar flames considered the case of flames burning in earth's gravity. More recently, they have started to consider the case where no gravity is present. In the absence of buoyancy forces, hot gases no longer rise and the shape of the flame is quite different. The experiments are performed on board NASA's KC-135 microgravity aircraft, see CLDFlame. Investigation of the Transition from Lightly Sooting towards Heavily Sooting Coflow Ethylene Diffusion Flames, Mitchell D Smooke, R.J. Hall, M.B. Colket, J. Fielding, Marshall B Long, Charles McEnally, Lisa D Pfefferle, 2004,Comb. Theory and Modeling, 8. The Electrospray and Combustion at the Mesoscale, S.A. Kaiser, D.C. Kyritsis, P. Dobrowolski, Marshall B Long, Alessandro Gomez, 2003, J. Mass Spectrom. Soc. of Japan, 51, 42-49. Reaction-Rate, Mixture Fraction, and Temperature Imaging in Turbulent Methane/Air Jet Flames, J.H. Frank, S.A. Kaiser, Marshall B Long, 2002, Proc. Comb. Inst., 29, 2687-2694. Polarized/Depolarized Rayleigh Scattering for Determining Fuel Concentrations in Flames, J. Fielding, J.H. Frank, S.A. Kaiser, Mitchell D Smooke, Marshall B Long, 2002, Proc. Comb. Inst., 29, 2703-2709. Multi-dimensional Diagnostics in Space and Time, Marshall B Long, C.F. Kaminski, K. Kohse-Hoinghaus, J.B. Jeffries, 2002, Taylor and Francis, Applied Combustion Diagnostics. A Comparison of the Structures of Lean and Rich Axisymmetric Laminar Bunsen Flames: Application of Local Rectangular Refinement Solution-Adaptive Gridding, Beth Anne Bennett, J. Fielding, R.J. Mauro, Marshall B Long, Mitchell D Smooke, 1999, Combustion Theory and Modelling, 3, 657-687.